Do you have a paper or a research project you’re really proud of? Do you want to reflect on experiences or courses you’ve created with your peers and colleagues? You can easily showcase your work by creating an ePortfolio in K-State Online. Click Account in the left-hand global navigation of K-State Online. For step-by-step instructions, view the guide How do I create a new ePortfolio as an instructor. Once you’ve created an ePortfolio you can control who sees it by choosing to make your ePortfolio public or private. You can also download the contents of your ePortfolio to a zip file. K-State Online Canvas hosts ePortfolios for each faculty member. 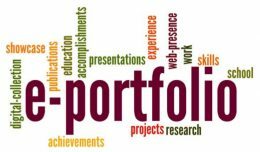 An ePortfolio is a website where faculty can upload their best work from multiple courses, and any of their professional and academic work to showcase their learning process. The ePortfolio can include artifacts that you upload, or that you’ve submit to your Canvas courses.